Last week Markus invited me and the usual suspects to spend the weekend at his place in Milton, Ontario. I was reluctant to go at first, spending the last few days before OLS away from home, but going turned out being a good idea. Despite extreme heat, we had lots of fun. Markus made me promise to blog about it. On Friday night we went to a bar called Nascar. The goal was to find a bar that best says "hicktown." I ended up feeling sorry for the place, seeing as they had all of about eight paying customers on a Friday night. That figure includes the really bad karaokeists. 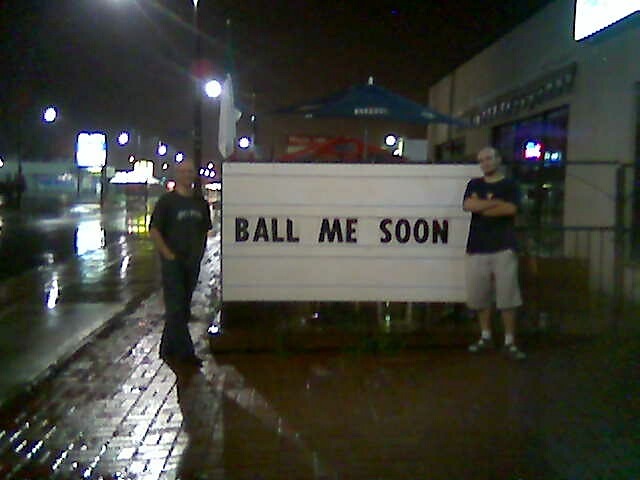 Also, through no fault of my own, the letters on the sign in front of the building happened to rearrange themselves to spell "Ball Me Soon." Funny. Saturday was even more fun, if "fun" is interpreted as "pushing around a 3800kg Ford Excursion." Markus' work truck was having some serious problems after we got far away from his place. It would just run very well and then suddenly choke and die. For better or worse, its frequent stalls and unwillingness to start added to an entire layer of adventure to the trip. We'll have to do this again some time.